When in Doubt? Run it Out! AutoPilot The First Five. Put yourself on AutoPilot for the first five minutes. Don’t overthink. Shut the Off Valve to the Ego which is awesome at grandstanding, procrastinating, rationalizing, and manufacturing excuses NOT TO RUN! Recognize it’s your Lower Mind, not your Higher Mind and just DON’T THINK; GET OUT! within 5 minutes, your chi will start to flow and all will be Sacred Sweat fr(om) there on out! Gear Up Early. Put your running gear on early. Place your hydration gear out. This creates chi-m(om)entum and makes it harder for the Ego to gain traction on why NOT to Run today. Run On Empty. If possible, Run first thing after your WF Morning Ritual®. If you can get out the door without eating, all the blood, oxygen, nutrients, and Prana will be serving your Sacred Sweat physiology instead of swarming the gut to digestive food. You will not die of starvation. You will however, access adipose tissue (stored fat) faster when you Run On Empty. Might take s(om)e getting used to, you’ll thank feeble ilg for this Gold Medal Tip soon enough! If you must eat? Eat sparingly. All-Ways take your BODYHEALTH® Supplements and your SUNRIDER® WHOLE FOOD HERBS! Run RELAXED. Periodically, run a kinesthetic diagnostics check. That is, inwardly scan your body for pockets of tension, bodyparts that are rigid or holding. ilg also likes to keep affirming Big Toe Push Off and Arms Drive The Legs with students. Occasionally, shake your arms out. Do a few Compression Breaths. Sink the tailbone. Relax your skin. Feel easy in your flowing body. Breathe Diaphragmatically. In other words, Belly Breathe! Really easy to get the Breath caught up high. Clavicular breathing is like a Welcome Mat for cramps, collapsed posture, and poor tissue oxygenation. Inhale; feel the belly expand. Exhale; press belly spineward. Got MULA?! Yup. Running is just another yoga vinyasa. So, make SURE you have Mula Bandha (the Root Lock) ENGAGED! 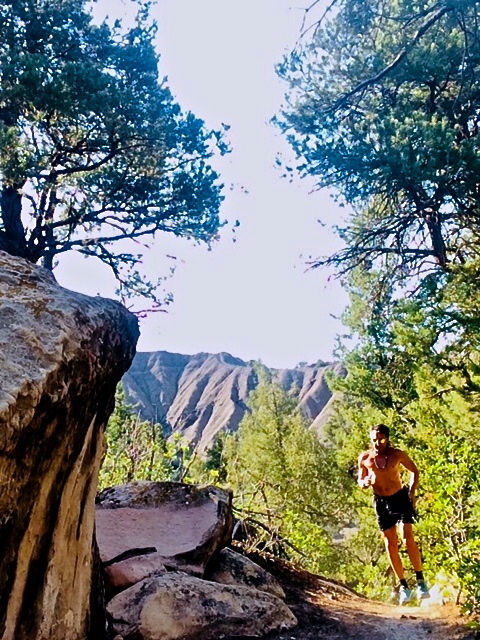 ilg tends to consider running more like an Dynamic Tadasana (Mountain Pose). Everything aligned, balanced, and supported by Mula Bandha. With an engaged Mula, your running bec(om)es Divinely Supported by the Energetics Of Enlightenment. And? If we are running toward Enlightenment? Where, why ARE you running!?!?! Transition Into YogaToes®. Unless you have like Adult Responsibilities (insert an ilg shuddering at the thought) after your run, do NOT shower! Save the Precious Water! The Sacred Sweat is actually a karmic sweat (prasadeva) and should be toweled INTO your precious Skin, not showered away. ASAP after your run, spread your toes into the toe spreader device known as YogaToes®. Many Runners get cramps and injuries because they allow their foot bones to become stiff, brittle, unable to disperse bodymass movement naturally. Wait 20 Minutes Before Eating. Consider creating s(om)e space in which to passively or actively ‘journal’ or ‘digest’ your Sacred Sweat. Endorphines and Higher Mind will continue to enjoy a sattvic state for at least 20-minutes post Sacred Sweat. Take Advantage of this Ramped Up Higher Vibrating Version of yourself and journal, meditate, create, etc. It’s a special Spaciousness. Take advantage of it. Hook Up A Spider! Yeah, dat’s right! Get UPSIDE DOWN and INTO BACKBENDS ASAP after running! Enter: ilg’s Spider Medicine Inversion/Backbend Routine®. Takes only a few minutes or feel free to linger in the postures if you have the time. However, sustained Inversions and Backbends after a Run? Will mitigate all tissue and skeletal compression and flush out fatigue acids, and provide much needed traction to the cervical spine which really takes on a lot of shock from running. Spider Medicine Routine® will also facilitate the spiritual energetics of Anahata Chakra which are invariably opened from running, yet shut down quickly after Running unless backbends are performed.